"It’s a communal effort made easier by some of the best outdoor gear on the market." Home is a welcome reprieve after a long day at work. The same goes for our team of wounded soldiers climbing Mount Whitney this September, except the office is 14,505 feet of granite rock and home conveniently stows away in a 70 liter pack. The Mission: Mt. Whitney team will push their bodies up the highest peak in the contiguous United States so we opted for comfort back at base camp. Thanks to gear sponsors like Big Agnes and Backcountry.com conquering barriers comes with a good night’s rest. The work isn’t done when the Mission: Mt. Whitney arrives at base camp after a long day on the trail. Some pump water, others set up tents and collect firewood in anticipation of nightfall. It’s a communal effort made easier by some of the best outdoor gear on the market. To outfit base camp with a few essential items we turned to Backcountry.com, which stocks everything from spatulas to performance bike parts. The expert customer service representatives guided us to the MSR XGK stove for a reliable backcountry burner, paired with the MSR Miniworks EX microfilter for pumping water. We found everything we needed on Backcountry.com, including the kitchen sink! (a 10 liter collapsible model by Sea to Summit). Backcountry.com is about “gear, grit, and connecting people to their passions.” That’s a motto Soldiers to Summits is on board with. 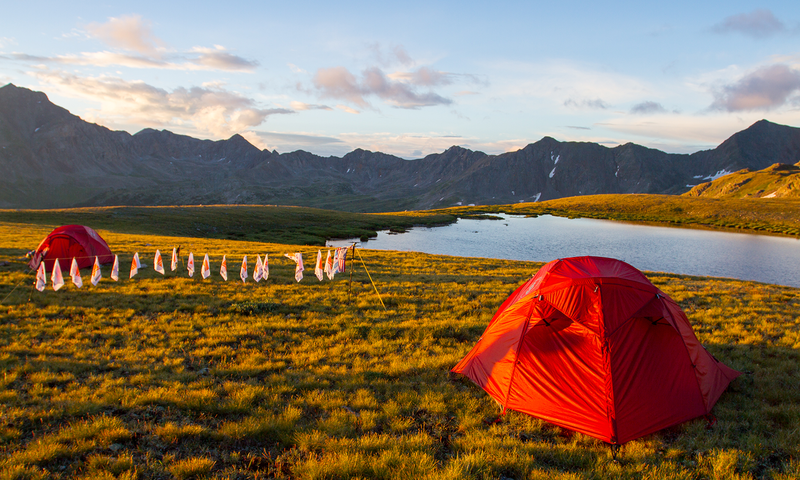 Big Agnes, known as “The Mother of Comfort,” is the unofficial sleep sponsor of Mission: Mt. Whitney. Based in Steamboat Springs, Colorado, Big Agnes is familiar with the terrain our soldiers have been training on for the last few months. We went to Big Agnes looking for a four-season tent that would keep our soldiers comfortable no matter the weather. They answered with the top-of-the-line Royal Flush 3, a hardy three man structure designed for serious mountaineering. For comfort we chose the Triple Core sleeping pad, which features a foam layer and air chamber and is rated 0°F. The Triple Core can also be inserted into the Cyclone SL Chair Kit to create a superlight camp chair for hanging out by the fire. The soldiers are sleeping in the super warm McAlpin SL5 or Storm King 0 bag. We are confident outfitting our team with gear from Big Agnes and Backcountry.com because these companies live their passions. We hope this expedition enables the soldiers of Mission: Mt. Whitney to embrace their own fire on the way to conquering summits.